"100 Years of Wooden Glory" is the epitome of coffee table collectibles for classics enthusiasts. Largely pictorial, this upmarket title's first ten chapters showcase colourful historical anecdotes alongside stunning photography of the early pioneering efforts of boat builders in Canada, the United States, Europe and Australia from 1915 - 1959. It is a compelling read that connects the dots, illustrating how these timeless boats and the individuals who owned them have impacted modern history. From there, the book leaps forward several decades to the purveyors of tradition. Companies who today, are building classically styled vessels using the latest in construction materials and technology in order to preserve the timeless designs of the "Golden Era" of boating. 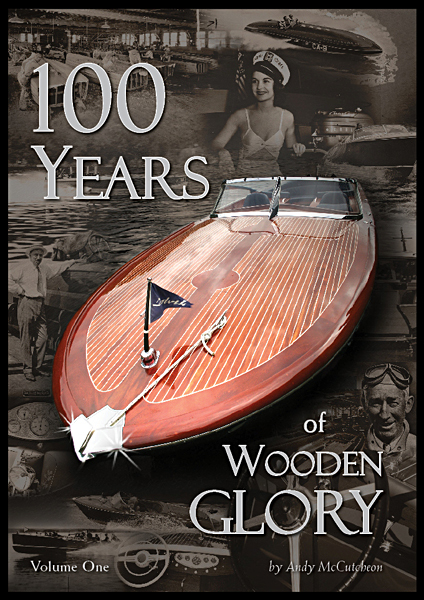 "100 Years of Wooden Glory" is a 250-page perfect bound, soft cover title measuring 240mm x 340mm. It?s textured cover and 150gsm gloss pages will be an ideal adornment to any setting. The first 500 copies printed will be author signed and numbered "Limited Edition" versions adding to their future collect ability. Frecheville-Heaney Boat builders . The Electric Launch Co . Hacker . Garwood . Disappearing Propeller Co . Ditchburn . Greavette Boatworks . Chris-Craft . Norman Wright & Sons . Riva . The Rum Runners . Azzura Marine . Aquamajestic . Pegiva . Dolvik . Van Dam Custom Boats . Marine Classics . Cherubini Yachts .